App Store Optimization isn't just about finding new ways and approach to get users to discover your app. It has evolved to encompass the complete app marketing funnel — including the creatives and strategies you can harness to ignite emotions and inspire users to explore your app after the install. Learn from the real-life examples and experiences of David Lane, Founder & Managing Director of Fat Fish Games. The independent games studio in the U.K., which was named Best Indie Game Developer at the 2015 Apps World conference, has produced several successful apps including Bubble Heroes, which was recently selected as one of Apple's 'Game of the Week' in 80 countries. Smart A/B testing allowed the company to make some tough choices — allowing Fat Fish to increase the app install rate for its flagship game Bubble Heroes by 18%, cut CPI by half, and save weeks in manpower. 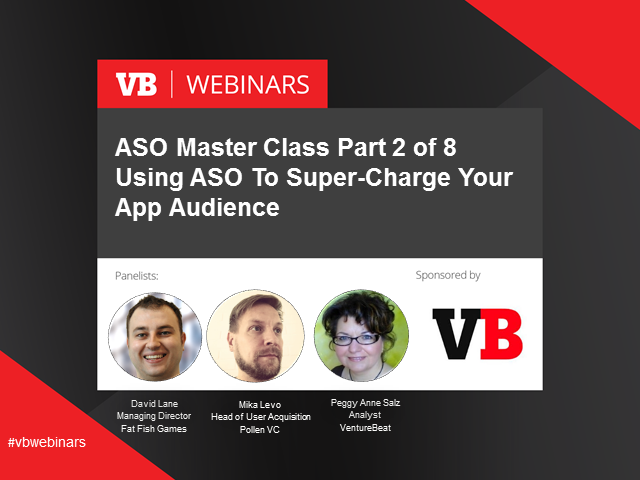 Discover how you can take your app to new heights without growing your budget or the headcount of your UA team by attending this VentureBeat webinar, where David Lane, Founder & Managing Director of Fat Fish Games, and Mika Levo, Head of User Acquisition at Pollen VC, will join Peggy Anne Salz, author of the report, to share proven and practical advice to super-charge your app store presence and your app company results. *Learn practical approaches to optimize creatives and other key app store elements that engage your audience. *Discuss metrics that matter and the approaches to A/B testing that will allow you to determine with certainty what flies and what fails. *Discover the tips and tricks that will allow you to drive the reviews that are essential to raise your app profile and appeal.